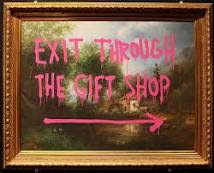 I just watched the wonderful film Exit Through the Gift Shop, and it has left me spinning with excited archetypal awareness. It is a film about the emerging street-art scene of the the last decade, and focuses on one frenchman living in LA, Thierry Gueta, and his obsession with filming nearly every moment of his own life. 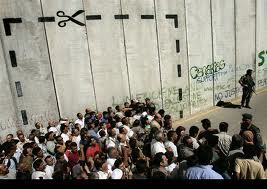 He constantly has his video camera turned on, and the people around him get used to the omnipresent filming. He starts to document the work of graffiti artists that he encounters, and he becomes obsessed with filming the work of the most celebrated underground artists of our time. 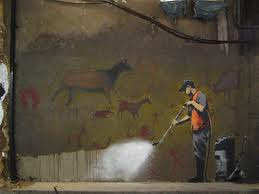 The most famous, and most illusive, artist that he pursues is the british phenomenon known as Banksy (his actual identity is not known). Banksy is a kind of artistic Robin Hood Zorro figure, who with stencils, often under the cover of darkness, creates anti-establishment artistic statements in public places. 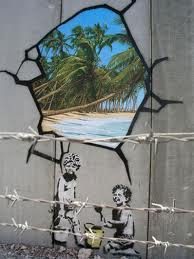 His fame became more pronounced in 2005 when he managed to paint nine images on the Israeli West Bank barrier wall, one depicting children digging a hole through the wall. Through a series of fortunate connections Gueta finally tracks Banksy down and earns his trust. We see him accompanying Banksy on his night-time missions to leave his artistic mark on various cities around the world. What is fascinating about the film is that it starts out being a film about Banksy and other guerrilla artists, but gradually the most fascinating chararacter becomes Gueta himself, who at a certain point in the film decides to start creating street art of his own. Gueta is the one making the documentary, but Banksy (who we see in the film always with his face and voice obscured) turns the camera around to focus on Gueta’s art. What unfolds is an exciting drama that raises many questions about the nature of art, the nature of fame, and the exploitation of art and artists for financial gain. For me as an archetypal astrologer it is quite a process watching a film like this. There are so many levels and angles of possible archetypal/astrological interpretation that I can take. 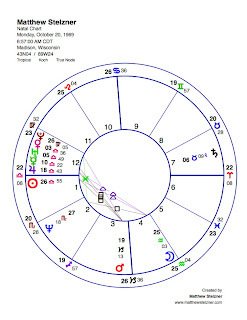 I can focus on the collective alignments that might be relevant; I can look at the director’s chart (and his/her transits); or I can focus on any of the actor’s charts/transits. Sometimes it is challenging to discern what the most prominent emerging archetype is, and it can be hard to know where to look for it. In this case a number of things jumped out at me, and I want to share them here. The first thought I have, given the mass popularity that this film is achieving in the recent period –it is one of the most talked about documentaries of the past year, it has a 98 percent approval rating on Rotten Tomatoes, and it has also been nominated for the Best Documentary Oscar– is that it is archetypally reflective of the powerful collective Jupiter-Uranus conjunction that is currently in the sky. The most dominant archetype of the film is the Uranus principle. This is a film about rebels, pranksters, tricksters, and law-breakers, and these are all qualities that Uranus is said to rule. 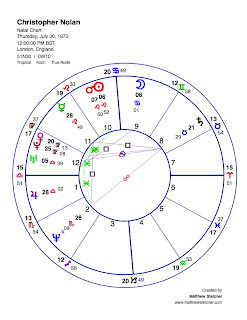 In the case of this film there is a very specific form of the Uranus archetype that seems to be dominant, and this is the Jupiter-Uranus combination that has been in the sky during the period of the film’s widespread popularity. The Jupiter-Uranus archetype is the combination that celebrates and honors (Jupiter) the rebel energy, and it is also the successful revolutionary archetype (as we are seeing so clearly in Egypt this past week), and this is a film that celebrates and honors the successful law-breaking artists that are featured. It is also fitting for the Jupiter-Uranus combination that this is a film that has itself been very successful and is receiving many honors, including the Oscar nomination. 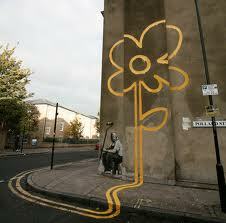 It is also about the huge success and wealth that these street artists have begun to achieve in recent years. The historical art tradition that is most referenced in the film is that of the Pop Art phenomenon of the 1960s, and the work of Andy Warhol. That scene decisively emerged with Warhol’s first exhibitions during the Jupiter-Uranus opposition of 1962 (which was overlapping with a Uranus-Pluto alignment, as is the current Jupiter-Uranus conjunction). 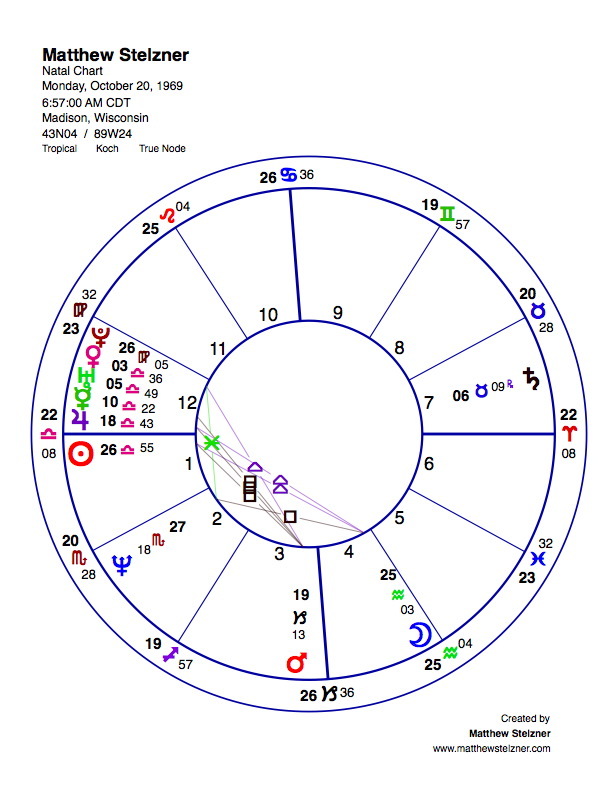 As in the 1960’s, the current collective energy is also informed by the Uranus-Pluto archetype (in the 1960’s there was a conjunction, and now there is a square). And this energy is also clearly present in the film. One of the main qualities that the film conveys, besides all of the rebel prankster energy, is that of the extreme adrenaline-pumping danger that these artists are experiencing all the time. These guerilla artists work under cover of darkness, often climbing up buildings and over roof-tops, precariously perching on risky footholds, and all the while having to stay on the lookout for the cops. This is Pluto’s realm, that of the underworld and the thrill of living life on the edge. And so the film perfectly conveys the combination of Uranus and Pluto coming together in the world of art. 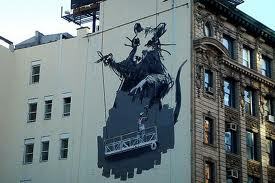 Unfortunately, most of the main artists that are featured in the film, including Banksy and Gueta (who gives himself the name “Mr. Brainwash” once he actively starts creating street art) do not have available birth data. When I see a film like this my heart breaks that I can’t look at the charts for the featured personalities, and now Banksy and Mr. Brainwash are right at the top of my “most wanted birth data” list. I don’t think it is very likely that we will ever know Banksy’s chart, as he is such a motivated trickster when it comes to concealing his identity, but it is possible that we may eventually get Gueta’s data, and that is going to be quite a fascinating chart to study along with this film. The one person featured in the film whose data we do have is the artist Shepard Fairey. 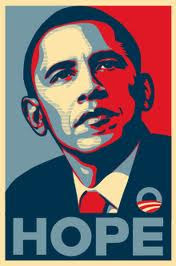 This is the person who became known for making the famous Barack Obama “Hope” poster (and that brought him much legal controversy concerning whether he stole the image from an AP photographer). In the film we see some of Fairey’s early street-art campaigns featuring his well-known Andre the Giant images. 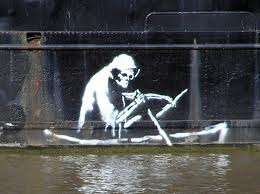 Gueta befriends Fairey in the film, and it is this connection that eventually leads him to Banksy. If we can take Fairey’s chart as a kind of representative for all of the street artists featured in the film, it is quite illustrative. When I study his chart, I am, of course, going straight for his natal Uranus, and I can see that he has two major Uranus hard aspects. 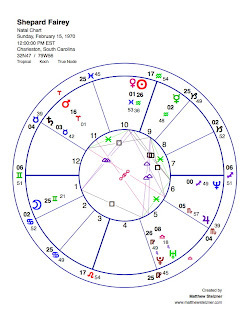 He is born two months after the decade of the 1960s ended, in February 1970, when there was still a very powerful Uranus-Pluto conjunction in the sky, and it seems very fitting that he would be born with this aspect. He is born with the conjunction, and he becomes a successful and well-known artist (with his natal energy in resonance with the zeitgeist) as the collective square comes into alignment. Fairey is also born with Mars opposite Uranus, and this is another archetype that is really consistent with the themes of the movie. I’ve heard Rick Tarnas refer to this combination as the “street-fighting-rebel archetype,” and the “prankster archetype,” and it really fits the energy that many of these artists are embodying in the film. These are individuals who are aggressively (Mars) pushing the boundaries of what is considered acceptable by society. Mars-Uranus is also a risk-taking energy, and it is really consistent with the way Fairey and others are practicing their art on the edge of danger, often risking their safety in the places that they do their work. In conclusion, I want to share another meta-level to my archetypal experience of this film. It is important to note that I personally had a very strong response to this movie, and therefore it is necessary to also reflect on what it is archetypally in me, that had such a powerful experience. I really love watching films about rebels, and the rock-and-roll side of me just delights in seeing people breaking the rules (with the graffiti in this case) and getting away with it. 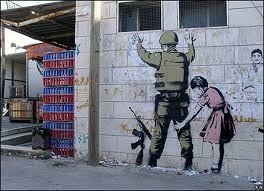 I also love the combination of art and rebellion, and I have always been drawn to revolutionary artists. Watching artists pushing the boundaries, and performing social commentary in such a radical way as this film portrays just totally satisfies a deep part of myself. Now, I’m sure there is probably a way in which the themes of this film have a kind of universal appeal, and archetypally they will resonate with the Uranian spirit that lives in every human psyche, but it is also the case that some people will love this film more than others. And so here I must bring in my own personal astrological chart to this blog for the first time. I was born in 1969 with a Venus-Uranus-Pluto triple conjunction (with Venus in between Uranus and Pluto), and it is this part of me that is in total resonance with this movie. As I was watching it I could feel this part of me waking up and coming to life. These three planets together perfectly capture the energy of this film. We have already explored the Uranus-Pluto archetype, and its relevance, and it should be clear why Venus would amplify the themes we have already explored here. Venus is the goddess of art and beauty, and when combined with the revolutionary energy of the Uranus-Pluto archetype, it really captures the major motifs that are at work in this movie. It is very common for someone who is born with a particular archetypal combination to be attracted to works of art, literature, music, and film that are expressive of that combination. We see this all the time. There seems to be some kind of magnetic field of attraction that draws similar expressions of the archetypes into each other’s orbit. In this case, as soon as I heard a little bit about what this movie is about I was immediately drawn to it, and then when I actually started watching it I was just completely enthralled by it. The psyche delights in seeing its own potential mirrored back to itself, and that was certainly my experience with Exit Through the Gift Shop. I may have to go buy some spray paint. 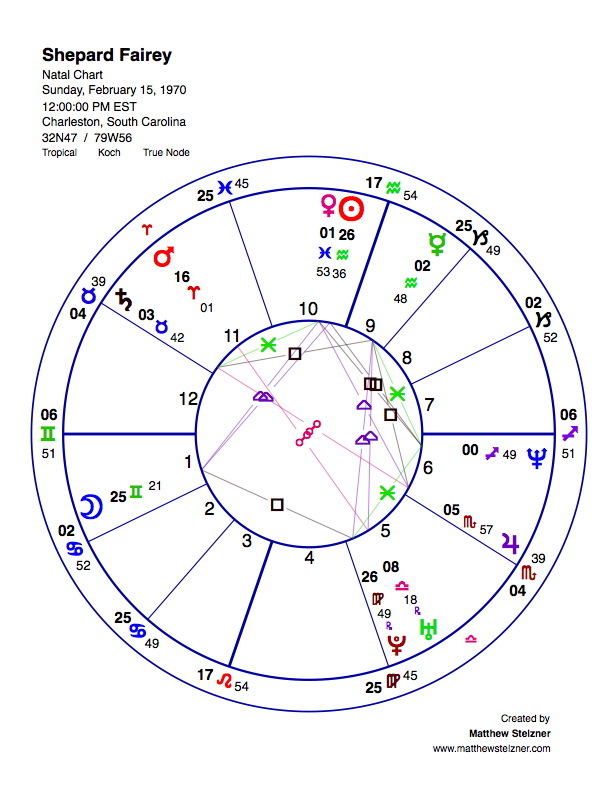 Shepard Fairey’s birth data is from Wikipedia, no time, so chart is cast for noon. My own chart is an exact-timed chart, with the birth time coming from my birth certificate. 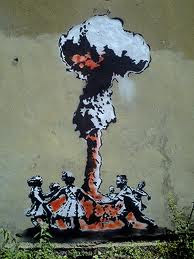 All images (except for Shepard Fairey’s Hope poster) are photographs of artwork attributed to the artist known as Banksy. Another film that got a lot of attention this past year is Christopher Nolan’s Inception. The film is nominated for the Best-Picture Oscar, and today the Writers Guild Awards gave Nolan the award for best original screenplay. 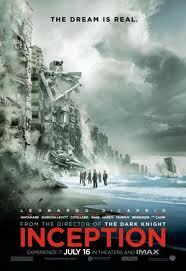 I loved the film, and I thought it was one of the most inventive movies that I have seen in a long time. I also hugely enjoyed watching the film from an archetypal perspective. I knew going into the movie that Nolan was born with a Mercury-Saturn-Neptune t-square, and it was remarkable to see how many different ways that that the film is an expression of that archetypal combination. Inception is the science fiction story of a character named Cobb (played by Leonardo Dicaprio) whose job it is to use a form of consciousness technology to illicitly enter into another person’s dreams and then steal valuable information that is revealed in the dream-state. The film opens with Cobb attempting one of these dream-heists, but with him failing in the attempt. The person who Cobb tries to steal from (Saito, played by Ken Watanabe) turns the tables on him and then offers him another job. Instead of trying to steal information, this time Cobb is now tasked with inception: the implanting of an idea within the dream-mind of another person. Saito hopes to perform the inception so he can manipulate his victim for business purposes. This is an incredibly difficult job, but Cobb ultimately accepts it because the reward he is offered would allow him to return home from his criminal’s life on the run, and allow him to be reunited with his children. As the story unfolds we discover that both Cobb and his wife Mal (played by Marion Cotillard) had become deeply engaged with the dream technology, and at a certain point they got trapped in a kind of dream-limbo that it took years (of dream-time) to escape from. They got so lost in the technology that they ultimately struggled to stay in touch with reality. Even when they were no longer trapped in the dream-world, Mal became convinced that they were still dreaming, and she concluded that the only way to wake up to reality was to kill herself (in what she felt was still dream consciousness). And so the film is pervaded with the profound grief of Cobb’s character who has tragically lost his wife to this technology, and is now separated from his children. I will assume from here on that everyone who is reading this has seen the film, and I won’t say anything more except that by the end of the film all of the above exposition is thrown into question, and the viewer is left feeling very much like Cobb and Mal in limbo, questioning what was real, and what was a dream. This film is obviously very Neptunian, and we would expect the filmmaker to have significant Neptune aspects. Neptune, of course, is the planet that rules dreams, and it is Neptune that is the god who is present at the moment we drift from waking consciousness into sleep and dreaming consciousness. Neptune also rules consciousness itself, and it relates to altered-states and experiences of confusion and disorientation. 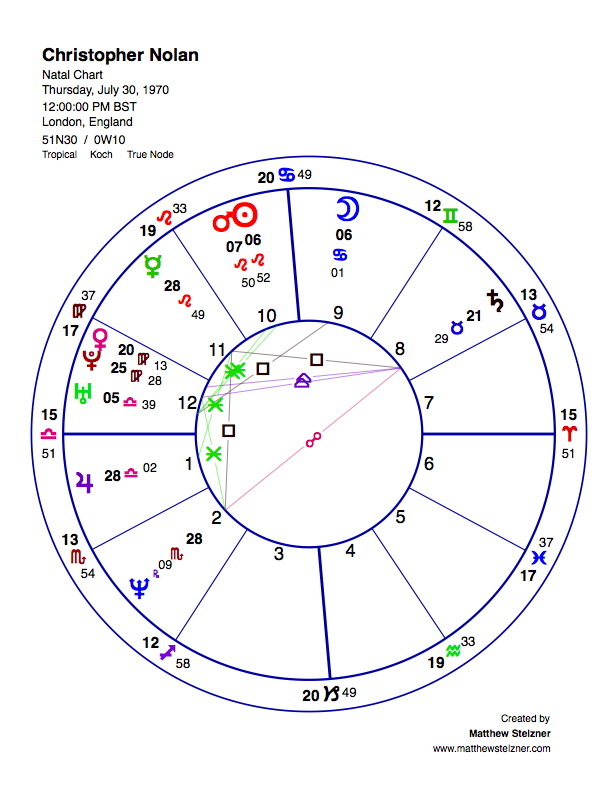 In this case, Christopher Nolan has a t-square of Mercury, Saturn, and Neptune, and in this piece I want to especially explore both the Mercury-Neptune square that he is born with, and his Saturn-Neptune opposition. I associate both the Mercury-Neptune archetype and the Saturn-Neptune archetype with people who regularly do dream-work of different sorts. 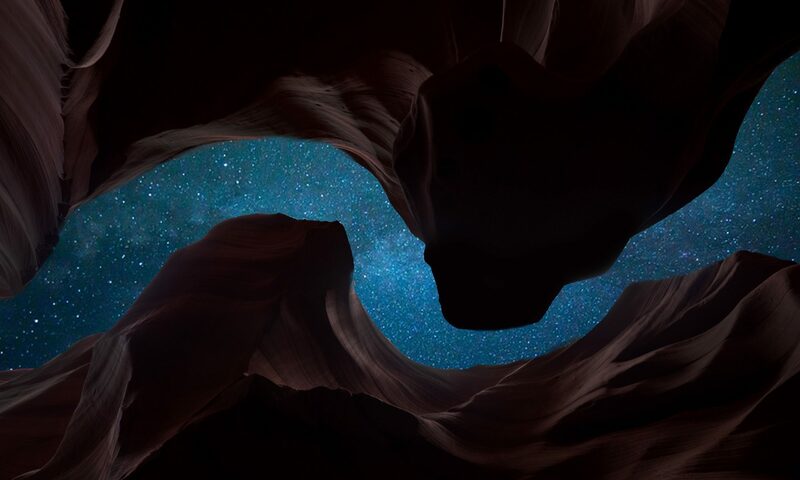 You see Mercury-Neptune in the charts of people who like to write (Mercury) down their dreams (Neptune), and who are looking to find a communication (Mercury) from their unconscious mind within the dream (Neptune). In this film the Mercury-Neptune fits both the use of the dream technology (Neptune) to steal valuable information (Mercury), as well as the process of inception where an idea (Mercury) is planted inside the mind of the dreamer (Neptune). Saturn-Neptune is associated with dream-work for different reasons. Saturn is the principle that has to do with discipline and hard-work, and so you see it in people who are disciplined with a dream practice, and who work hard to bring their dreams (Neptune) back into waking reality (Saturn). Thus the Saturn-Neptune archetype has something to do with the hard work of integrating dream messages into our everyday waking consciousness. In the film, Saturn-Neptune is consistent with the main character’s attempt at mastery (Saturn) over their own dreams, and the dreams of their target. There are many other Saturn-Neptune motifs that are present in the film as well. The whole struggle with the nature of reality that is central to the film is a classic expression of the archetype. I’ve often heard Rick Tarnas refer to this combination as the “Is it real or isn’t it?” archetype. Saturn can be seen as the reality principle, and Neptune can be confusion, illusion, or delusion, and often when the two are in hard aspect you will get people who have moments where they struggle to stay in touch with reality. Thus it is an archetype that sometimes can relate to madness or grappling with insanity, and we see several characters in the film struggling to stay in touch with reality. Saturn-Neptune also has a lot to do with grief and melancholy, and you often see it present when there is a significant mourning process (consider Elisabeth Kubler-Ross who is born with a Saturn-Neptune square and who wrote extensively about the grief process). In extreme cases, Saturn-Neptune is also an archetype that seems to relate to suicidality, or with people whose cosnciousness (Neptune) is consumed with death (Saturn). In this film we have characters who utilize death as a way to escape from their dreams, but in the case of Mal we have someone who is confused, and thinking she is still trapped in a dream, accidentally takes her own life. Saturn-Neptune is also associated with illness and infectious diseases, and one of the great archetypal quotes that I love from this film is when Dicaprio’s character asks “What is the most resilient parasite? Bacteria? A virus? An intestinal worm? An idea. Resilient…highly contagious. Once an idea has taken hold of the brain it’s almost impossible to eradicate.” Saturn-Neptune is the infectious parasite, and with Mercury it is the idea that is infectious. Saturn-Neptune also really fits the whole theme of dream-building in the film, where Saturn brings the architectural dimension to the dream landscapes that the characters have to construct in advance of their mission. It is also the archetype of sleep-problems, insomnia (note that one of Nolan’s previous films is titled Insomnia), nightmares, and the potential for becoming trapped (Saturn) in a dream state. Another film that is archetypally similar to Inception is the 1998 Alex Proyas film Dark City. It is another case where you have characters struggling with the nature of reality and who have their consciousness manipulated while sleeping. It is directed by Proyas who is born in 1963 with Saturn square Neptune, and is released in 1998 under the next collective Saturn square Neptune (The Matrix also has some similar motifs and comes out under that same alignment in 1999). Note that there was a tight (within 2 degrees) collective Saturn-Neptune quincunx in the sky when Inception was released last July. Mercury-Neptune is an archetype that has a big potential for mental (Mercury) confusion (Neptune), and this is a theme that is clearly explored here in this film (and also explored to great effect in Nolan’s earlier film Memento). Mental confusion is also a state of consciousness that many film viewers experienced both during and after watching the film. The film is so multi-layered (and the dreams are so multi-layered) that the viewer must struggle to keep track of what is happening. And thus the film induces in the viewer the feeling of the Mercury-Saturn-Neptune energy that Christopher Nolan is born with. Also consider how difficult (Mercury-Saturn) it must have been for Nolan to write this incredibly complex screenplay. I’ve heard that he had to construct diagrams (like the characters in the film) to keep track of all of the multi-levels of the dream realities in order to make sure all the puzzle pieces fit together. The film is radically ambiguous, and many different interpretations are possible. It is conceivable, for example, that it is actually Dicaprio’s character who is the recipient of the inception process, and it is he who is being manipulated in the dream landscape from the very beginning of the film. But there is not a definitive interpretation, and like the nature of the poetic Mercury-Neptune archetype, we are left in a dreamy state of reflection in the end. Thus, the film performs a kind of inception on the viewer, and like the characters in the film we are left asking ourselves: what is the nature of reality, and are we currently awake, or are we dreaming? Christopher Nolan birth data is from Wikipedia, no birth time, so chart is cast for noon.